You can call them matzo balls. Or knaidlach. And you can transliterate the latter any one of nine ways the YIVO Institute provides for the yummy orb. However, if by chance you are a participant in the Scripps National Spelling Bee, you must abide by its official dictionary, Webster's Third New International. Webster's, and therefore bee sponsor Scripps, insists on knaidel for the singular. Whatever you call them or however you spell them, these delicious dumplings are iconic in Ashkenazi cuisine. The Matzo ball is so beloved that many metropolitan areas are home to a Christmas Eve dance called – you guessed it – the MatzoBall, billed by organizers as "the nation's #1 holiday party." The knaidel has even been the focus of competition, with chefs from California to New Jersey vying for the honor of having made the largest one. The current record holder is Noam Sokolow of Noah's Ark Deli in Teaneck, New Jersey. According to the Guinness Book of World Records, this 2009 creation (shown at ###) weighed 267 pounds and was made from 1,000 eggs, 80 pounds of margarine, 200 pounds of matzo meal, and 20 pounds of chicken base. Befitting the status accorded a cultural icon, police escorted it to Manhattan where an adoring crowd devoured it. Made from a mixture of matzo meal, eggs, water, and a fat such as oil, margarine, or even chicken fat (yes, schmaltz is back! 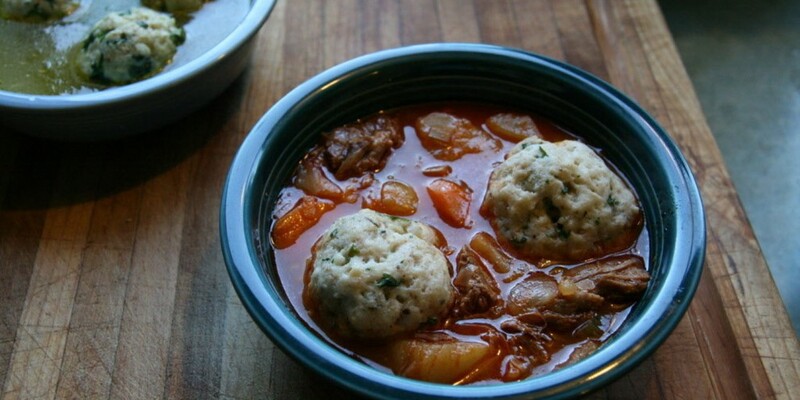 ), knaidlach are traditionally served in chicken soup and are a staple at Passover seders. But they are just as delicious in the middle of November – and a great way to use up the leftover matzo meal from the holiday. While most of us are familiar with the standard recipe for matzo balls on the side of a Streit's or Manischewitz box, there is actually great variety among these globes from around the globe. For a heartier knaidel than the standard, Joan Nathan introduces a Lithuanian beef-stuffed model in her Jewish Holiday Kitchen cookbook. The knaidlach are boiled first and then baked in a muffin tin with cinnamon sprinkled over the tops. Although some of my ancestors include Litvaks, I had never heard of this dish. But I can't wait to try it. And down South, matzo balls are a totally different kettle of, well, soup. In Nathan's Jewish Cooking in America, she introduces a Cajun recipe made with whole matzos, scallions, garlic, and chipotle pepper that she says came with immigrants from southern Germany. The Nosher website tells us that other cousins down South have devised a vegan twist on the savory sphere that they pair with a potlikker soup. (Potlikker is the liquid that is left behind after boiling greens or beans.) These matzo balls are made with traditional Southern ingredients such as collard greens, jalapeno pepper, scallions, corn kernels, and cornmeal – obviously not kosher for Passover but good the other 51 weeks of the year. Makes 12 matzo balls or 6 servings. In a small nonstick skillet, heat 1 tablespoon oil over medium heat. Add onion and cook, stirring often, until tender, 2 to 3 minutes. Stir in parsley and Creole seasoning to taste and cook, stirring, for 30 seconds. Scrape onion mixture into a medium bowl and let cool before next step. Add eggs and remaining 1 tablespoon oil. Mix with a fork until eggs are well broken up. Add matzo meal and mix until blended. Cover and refrigerate for 20 minutes or a few hours. Meanwhile, fill a large saucepan with salted water. Cover and bring to a boil. Moisten your hands and form the matzo ball mixture into 12 balls, using a heaping tablespoon mixture for each. Gently lower the matzo balls into the water with a slotted spoon. Cover, reduce heat to low and simmer for 15 minutes, or until cooked through. Carol Goodman Kaufman is a psychologist and author with a passion for travel and food. She invites readers to read her blog at carolgoodmankaufman.com and to follow her on Twitter @goodmankaufman.